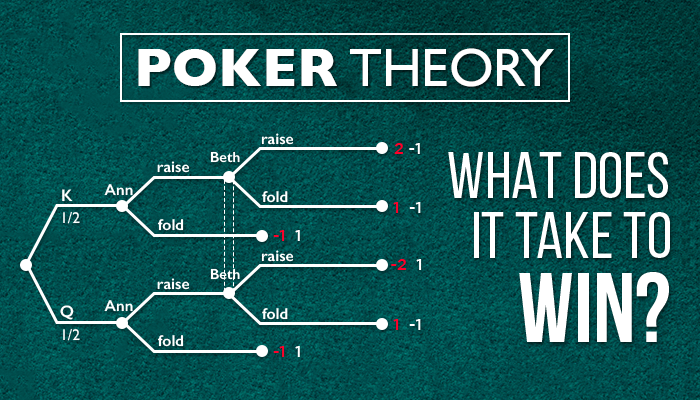 The last couple of years in poker, GTO (Game theory optimal) play has been all the rage. Moving away from intuition based reads, and using a more mathematical model of playing poker has been part of the constant evolution of poker. Adapting more logic based models for what kinds of lines you should take in poker is a great thing. BUT, how profitable is it really when applied to micro and small stakes poker? A simple example of someone who has an exploitable area of their game is such. Example 1: When Player Z has a flush draw, they always check and call when out of position, and they never bluff when they miss. If you knew this information for example, you could always make small bets on the river, even with your unmade hands, to get them to fold for cheap, or you could check through with your high Ace hands expecting to win at showdown a large percentage of the time. A person with a more balanced range of hands would look at what the optimal game theory line is with various types of flush draws, and would check/call X% of the time, Check/raise Y% of the time, and Bet Z% of the time. So, how profitable is it to implement a GTO strategy at micro and small stakes? The short answer is, it’s isn’t. In theory, your opponents should be playing micro and small stakes, because they don’t understand how to balance their hand range, and they have many very exploitable holes in their game. Many. Like, a lot… a ton. There will of course be some fellow students of the game at higher micro stakes and in some small stakes games that will have some understanding of this, and you’ll want to be aware. In general though, it’s best to look for the most exploitable holes in your opponents game, and make the highest EV bets, raises, and calls. The benefit from studying and understanding a GTO strategy, is being able to recognize when your opponent is deviating from ideal play. One of the most immediate effects of understanding GTO strategy, is you’ll become a better bluffer. You’ll understand your opponents range, and your perceived range much better, and you’ll be able to implement bluffs that have a higher degree of success. What you don’t want to do is get into fancy play GTO syndrome (FPGS) that I see very often on popular poker forums. I’ll illustrate a recent example to highlight what I mean. 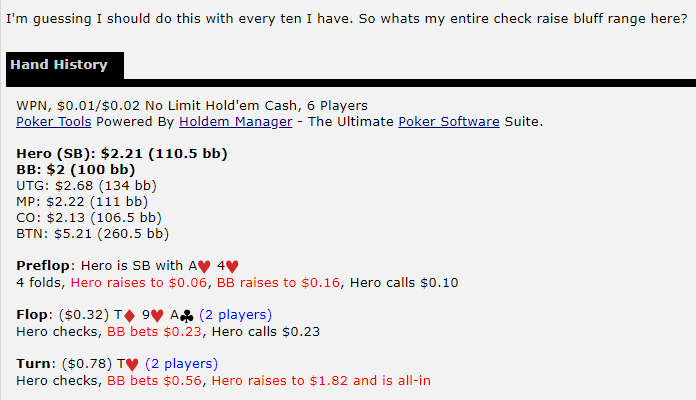 Here’s a hand from a micro stakes player on the popular 2+2 poker forum. Here our Hero in the hand wants to know what his entire check raise bluff range should be here. That’s not a bad question to ask, but the problem is hero has FPGS. For one, you don’t need many bluffs in your range in this spot. So why would you want to worry about implementing that against someone you don’t have any significant history with yet, AND try and get them to fold a better Ax hand? The answer is, you shouldn’t. There’s really no point. If you played this hand, and then check/called the turn (the higher EV line), you could ask later, what would be a good range of hands to have in my check-raise range on the turn here? That’s a good question to ask in theory away from the table. In game though, assuming you like money, and want to win money at poker, you should just be looking to take the highest exploitative EV line. Additionally, even at higher small stakes, and mid stakes and above, you should be looking to implement an exploitative strategy and take the highest EV lines. Once you build a good amount of history with your opponent, you should start balancing your ranges and bet sizing more. I’ll give you another simple example in a mid stakes game. Example 2: You have played less than one rotation at a 6-max cash game, and the MP open raises to 2.5BBs. It folds to you on the button with QQ and you 3-bet to 8 BBs. Everyone folds back to the MP player who calls. The flop comes (17.5 BBs): 6c Qc Ah. MP checks to you. With 17.5 BBs in the pot, this isn’t the time to try and balance your 3-bet c-bet sizing by betting 1/3rd of the pot. This player knows nothing about you, and you just flopped the second nuts. It’s time to go to value town with as big of a sizing as you think is reasonable. C-betting to 11-15 bbs is the higher EV line versus c-betting 6-8BBs. Go get your money, and worry about how your range perception is seen by your opponent when/if you start building history. I can’t tell you how many hands I read in forums where the above example happen. I think a lot of people get into static ways of thinking and approaching something, and then have difficulty adjusting to the actual situation that is in front of them. That’s at least my human observation, because I’ve seen it countless times at the poker tables over the years. Another thing to consider when you’re thinking about balancing your ranges is that it takes a LOT of hands with someone, to even start to try and understand what they might be doing that is exploitable (if they are a decent player). So if you’re worried about that regular in your online game knowing that you aren’t checking raising enough turns, or you’re over folding top pair to a turn raise… don’t. I’ve coached and talked with enough players to know that they don’t have this info unless they have a really long standing history with someone, or the player is just really bad. The bottom line here is, study GTO as it will make you a better and more thoughtful player, but don’t implement it when it doesn’t make sense (or dollars). Just take the highest EV line, and do the analysis and theory after you’re in a spot that you’re curious about. Good luck at the tables! Previous Post Hero Open Button vs. Big Blind Call Next Post Are using HUD’s an unfair advantage in online poker?